Shetara, 40, a midwife escaping violent attacks on her village in Myanmar, could tell her cousin was just hours away from going into labour. The trouble was, the Rohingya women were on a small boat crossing the Naf river into Bangladesh, after many days of desperate flight through the jungle. What lay ahead was unknown, but what Shetara did know was that her cousin’s increasing pains could only mean one thing. 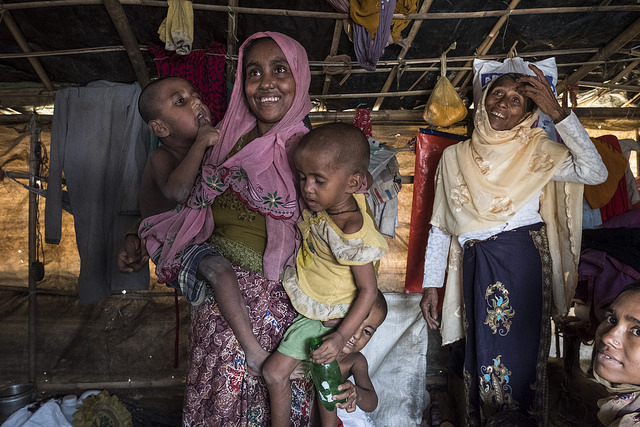 Shetara and Senowara, 25, were fleeing with their families from the continuing military attacks on the Muslim population in Rakhine state, Myanmar, with over 605,000 people forcibly expelled from the country since August 25th. For Shetara and Senowara, their most urgent need was to get to a place quickly where they could safely deliver the new family member. Their boat finally arrived at the Bangladeshi border but an hour and a half after arrival, there was no more time to look around for help. Senowara’s son was healthy, but the new mother was struggling with the experience—more than the pain, she says, she was overwhelmed with a sense of shame. It was a painful ordeal, in the crowded and unsanitary conditions of a refugee camp, but at least both mother and baby are alive and safe. Shetara breaks down as she remembers what happened to another cousin of theirs back home in Huwaikong on the day they left. 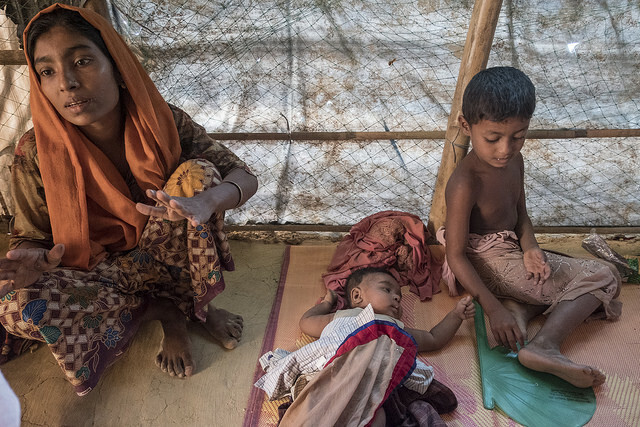 The upsurge of violence against the Rohingya since August has created the fastest-growing refugee crisis in the world. Northeastern Rakhine state is not accessible to independent verifiers but the accounts being given to humanitarian agencies receiving refugees at the Bangladesh border are consistent: the Muslim minority are being driven from from their homes, their houses and food stores burned, family members wounded or killed. For so many families like Shetara’s, by the time they make it to Bangladesh they are completely depleted – emotionally, physically, and financially. The long journey on foot, hounded by soldiers, fearful of landmines, without food or drink, costs them everything they have. The very young and the elderly have to be carried by younger relatives, as Senowara’s sister Dildar Begun, 28, a mother of five, told Caritas. “My father-in-law and I carried four children, and my older son carried one,” Dildar says. Caring on her own for her children, including a disabled son, and her elderly father-in-law, Dildar had received a call from Shetara telling her of the mass arson and killing in her village and urging her to leave at once. “I carried my disabled son on my back and my littlest one on my front. We had to swim across two or three canals in neck-high waters. Thankfully, others helped us to take my children across. “In that escape, I lost the only treasured item I was able to bring with me: the contact numbers of my other relatives. They are lost in the waters,” says Dildar. Shetara, Senowara and Dildar are now at Monyaghorna camp with their extended family. 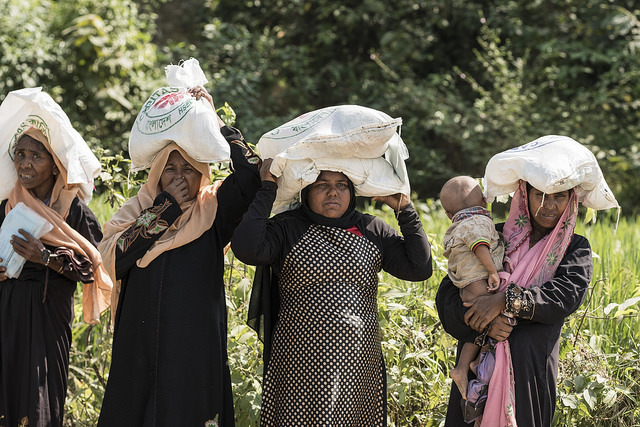 They have received lentils, cooking oil, salt and sugar from Caritas Bangladesh, who are providing food support and household items for 70,000 refugees in the immense camps. Forward plans include ongoing food assistance, emergency shelter, living supplies, water and sanitation, child protection, social services, and potentially design and infrastructure support for new camps. The tasks at hand are enormous. This resourceful midwife has quickly put her skills to use for other refugee women, and has already delivered three more babies. “It is a blessing if I can save the mother and child together. After Senowara’s baby was born, I was so relieved, so happy—the baby had made it. When I see a new life come into the world, I feel it is a gift from God,” she says. Shetara [left] talks to Caritas Bangladesh volunteer Yasmine Farjana.